Matthew Peterson: Let me ask you a quick bonus question, ‘cause I knew we wouldn’t have time for this. But just first, Tony, you wrote a book that came out last year called Kenny and the Dragon. What are you doing now? Do you have some other books in mind that you’re doing right now? Tony DiTerlizzi: Yeah, I’ve got a couple projects cookin’. I’ve got, next month is the debut of a new silly kind of little Golden Book, picture book series that I created with my wife called Adventure of Meno which is about a space elf and his best friend who’s a jellyfish. Tony DiTerlizzi: Nope, just a near sighted earth swimming jellyfish. Matthew Peterson: How fun! Holly, your second graphic novel in the Good Neighbor series just came out and it’s called Kith. What else are you working on right now? Holly Black: Well, actually I have a new series that’s starting in May. And it’s really exciting and a little strange because it’s really different from anything I’ve ever done before. It’s called The Curse Workers and the first book is White Cat. And it’s kind of a noir crime, caper, fantasy novel. Holly Black: So, it’s fun, but really different. Matthew Peterson: Is it for young adults or middle grade or . . . ? Holly Black: It’s for young adults. Matthew Peterson: Young adults, okay, good. Tony DiTerlizzi: It’s cool, I’ve read part . . . I’ve read about half of it on the plane on tour and it’s awesome. Holly Black: [referring to Mark Hamill’s voice work] So the joker is just chilling. Holly Black: In Batman, the animated series, it was amazing. Matthew Peterson: I saw the picture on your blog of you guys with Mark. I thought that was really cool. Holly Black: He’s a nice guy, very sweet. Matthew Peterson: One thing I’ve noticed as I was reading them, is that you don’t shy away from some of the scary moments. I mean there’s a sleeping giant there, and a man’s got his machete and like he’s going to kill the giant, and just little moments like that. I thought that was very interesting that you don’t shy away from some of the little bit more scary... like the movie. I saw the movie and it was a little bit scarier than I had remembered the books being, but now that I think about it, the books were. Tony DiTerlizzi: They definitely draw upon the old Grimm fairy tales or the Andersen’s fairy tales, which had lots of dark, gritty, little spooky page turning bits to them. But I think on top of that, the landscape has changed when those guys were telling their stories. Now kids are watching movies like the Spiderwick movie, that are completely visualized in every single detail. They’re playing video games where they’re doing far worse than, you know, stabbing a giant with a machete. Tony DiTerlizzi: You know, it’s kind of . . . in some ways I feel we’re keeping up with media, but in other ways it’s an old tradition to be able to have . . . you’ve gotta kind of have that edgy-ness to it I think for the reader to appreciate either the calmness or the good parts. We try to do it in a full 360 degree circle, ‘cause there’s a lot of darkness, but then there’s a lot of light. Tony DiTerlizzi: I mean, it’s kind of how life works, you know. Matthew Peterson: Yeah, and there’s humor and lots of adventure. 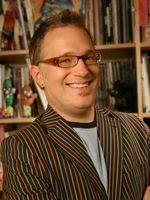 Tony DiTerlizzi: I don’t know about you, but I’ve seen adaptations of my favorite book from the theater and walked out and went, “Wow, they really blew that” or “That was just horribly done.” And it was kind of a weird position being in the different part of the equation, but overall I really felt that the film did a fine adaptation of the story that we told. And the film was about a book, I mean it was still about Arthur’s field guide and that knowledge that’s in the book and I kept waiting for them to pull that out. I know, Holly, you and I talked, we were like, “They made a movie about a book!” It was like Ha, Ha, Ha, Ha!! Tony DiTerlizzi: I don’t remember who it was, it might have been our editor, Kevin. But he came up with the idea of taking this 500-600 page story, which Holly and I had crafted of the Grace kids and just breaking it up into smaller books. Matthew Peterson: And you’ve created some new characters in this that have never seen the fairies before. You’ve got The Nixies Song, A Giant Problem, and then the third one that just came out is The Wyrm King.